There’s nothing like walking in the house and being knocked out by the glorious smell of fresh bread! These aromas stay in the hearts and minds of our family, I’m convinced. Scent has a direct link to the brain and memory. My kids totally remember those smells from growing up, and still crave them as adults. Here’s “How to Make Easy Homemade Bread” that your family will love! If something like bread baking can have this kind of effect on my family, I believe that it’s time well spent to perfect that skill! Like most things, bread baking didn’t come easy for me. I think because I grew up in such a “feminist/women don’t do that” kind of home, I just never saw these skills displayed, much less learned them, so it was like a foreign language the first time I heard it. But I can be taught and so can you! Bread making does take practice. If it doesn’t turn out perfect the first time, you’re in good company. Try again and you’ll get it! Bread also makes a fabulous gift! Beware, though, you’ll find yourself with more requests for another loaf or two than you bargained for. I speak from experience! But for the most part, baking a good loaf of bread isn’t that difficult. If you want to take it to the next level, you could grind your own wheat as well. Here’s the grain mill I use. I’m going to share 2 of my favorite bread recipes, that I use on a regular basis. The first is “Amish White Bread” and is from allrecipes.com. This bread has a hint of sweetness, kind of like that Hawaiian bread you see at the store. 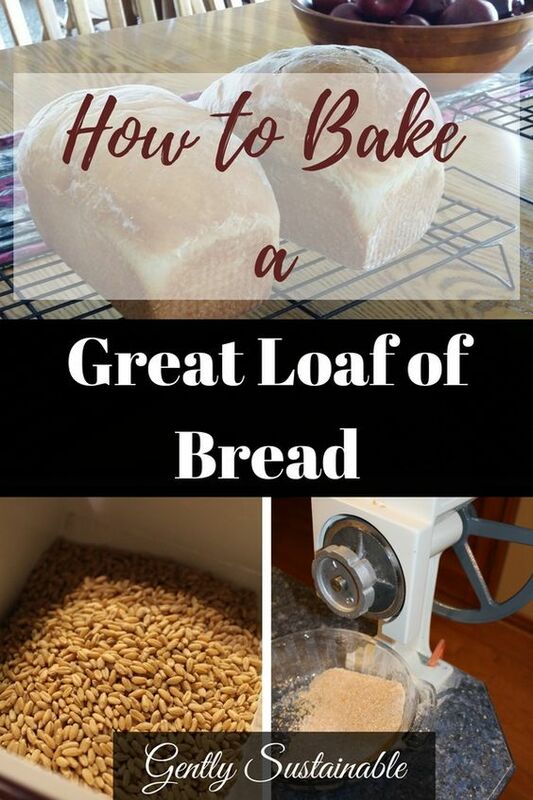 This recipe makes 2 glorious loaves of bread that is wonderful for sandwich bread, for about 50 cents! Dude! You can switch it up and roll some cinnamon and sugar inside for Cinnamon Bread. This fabulous and simple bread will make great sandwich bread and converts easily to cinnamon bread! Mix salt and oil into the yeast. Mix in flour, one cup at a time. Knead dough on lightly floured surface (or in a very large bowl) until smooth. Place in a well oiled bowl, and turn dough to coat. Cover with damp cloth. Allow to rise until doubled in size, about 1 hour. Punch dough down. Knead for a few minutes, and divide in half. Shape into loaves and place in 2-9×5 bread pans that have been greased and floured. Allow to rise for 30 minutes or until dough has risen at least one inch above pan. Bake at 350 degrees F (175 degrees C) for 30 minutes. You can bake the bread at 325 degrees F for about 35 minutes for a softer texture. I can make 2 loaves of this bread for about 50 cents, isn’t that ridiculous!? The next bread recipe is a family favorite as well, it’s called “Denise’s Soft n’ Satiny Dinner rolls or Bread“. This recipe came from a well-loved cookbook, and I unfortunately only have a single page left. I have made this bread for many years, using freshly ground flour, and my family absolutely loves it. Worth the extra hassle and ingredients, for sure! If you must use store bought whole wheat flour, that’s ok. It took me years to save for my grain mill. Just try to get it from the health food store where it’s refrigerated, most whole grain flour on the grocery shelves are rancid. 1/2 cup vital gluten Yep, we add gluten! Then add the following ingredients, in order, to your bowl. Mix slightly and let it sponge for 10-15 minutes. Keep an eye on it, it may come up over sides. Then add 3 tbsp. salt to mixture. Do not forget this! Add enough remaining flour to create a soft and slightly moist dough, one cup at a time. Knead in mixer 5-7 minutes or until gluten is fully developed. Then cover and let rise until double and punch down before shaping. At this point, cut the dough into 5 parts. You can make 5 loaves or 5 dozen rolls, or a combination of. Rolls just need to be placed on an ungreased cookie sheet and baked for 20-25 minutes at 350 degrees. Loaves need to be placed in greased and floured bread pans, not stainless steel or glass. Bake loaves for 30-35 minutes at 350 degrees. I've had friends make this bread for their husbands only to have their husbands offer to buy a new mixer or grain mill in order to keep the bread coming! No kidding! Thank you, Janet! Glad you’re here!